In this vegetarian and vegan recipe, you char the eggplant, similar to making Indian bhaigan ka barta, then add it to a meatless potato and tomato curry with plenty of curry powder, cumin seeds and a bit of cayenne pepper. It's delicious with or without the optional yogurt. Leave it out if you're eating dairy-free and vegan, or use a soy substitute. Pair it with rice or quinoa for a full meal. Char the eggplant. You can do this either on a grill (gas or charcoal would be best), over a gas stovetop range or by using a broiler. 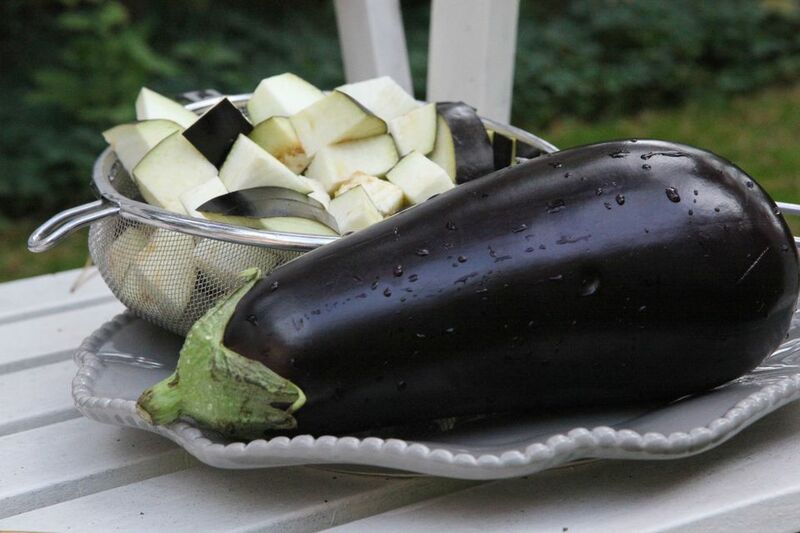 If using a grill, heat to high and place the whole eggplants directly on the grill grate. You want the flame to come into direct contact with the eggplant skins. After about 5 to 6 minutes, eggplant skin should be well charred, so turn the eggplant so that the flame can char all sides of the eggplant. The same process goes if you're using a gas stove. Use tongs to hold the eggplant directly in the flame and occasionally turn until all sides are well charred. The eggplant should be nice and soft. If you'd rather use a broiler, set your oven to broil or preheat your broiler. Place the whole eggplants in the preheated oven and heat until soft, about 10 to 12 minutes, turning occasionally. Once the eggplant is cool enough to handle, carefully remove the blackened skins. If you're lucky, it'll come right off. While the eggplant is being charred, chop the potatoes into about 1-inch chunks and pre-cook the potatoes. You can boil the potatoes in a pot of water until just barely tender (they'll cook later along with the eggplant and spices) or in the oven or microwave if you prefer. Heat the olive oil in a large skillet and add the garlic and onions. Heat for a minute or two, then add the cumin seeds. Heat for another minute, then add the curry powder, salt, paprika, and cayenne. Heat, stirring to avoid burning, for another minute or two, then add the fresh tomatoes, if using. If you're using canned tomatoes, don't add them just yet. Stir everything up to combine well, then add the potatoes. Allow to cook for 4-5 minutes, then add the mashed eggplant, canned tomatoes if you're using canned, and water. If you're using canned tomatoes, you can skip adding the extra water and just use the liquid from the can. Heat, stirring, for about 15 minutes. You may need to add a bit of extra water at this step, depending on how juicy your tomatoes are. Add the optional yogurt, stirring to combine and just to heat through. Try a squeeze of lemon juice or a bit of fresh chopped cilantro to top it all off.